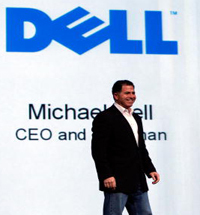 Dell Inc., several former executives, and Chairman and CEO Michael Dell agreed to pay more than $100 million to settle Securities and Exchange Commission charges that they failed to disclose material information to investors and used fraudulent accounting to make it falsely appear that the company was consistently meeting Wall Street earnings targets. Dell had disclosed last month that the company and Mr. Dell were in negotiations with the SEC and that it had established a $100 million reserve in anticipation of a settlement. Mr. Dell, former CEO Kevin Rollins, and former CFO James Schneider were charged by the SEC in connection with the disclosure violations. Mr. Schneider, former regional Vice President of Finance Nicholas Dunning, and former Assistant Controller Leslie Jackson were charged for their roles in the improper accounting. Dell Inc. agreed to pay a $100 million penalty to settle the SEC’s charges. Michael Dell and Mr. Rollins each agreed to pay a $4 million penalty, and Mr. Schneider agreed to pay $3 million, to settle the SEC’s charges against them.